How do I place text on top of an embellishment? /Design Tools - Artwork and Embellishments /How do I place text on top of an embellishment? To place text on top of an embellishment follow the steps below. Select the embellishment you wish to use. Note: the embellishment might be locked if you cannot select it. For detailed steps on how to unlock an embellishment, click here. Select your text and drag it on top of the embellishment. If you cannot see the text, it may be underneath the embellishment. To make sure the text is visible, you’ll need to make it the top layer or bring it forward. 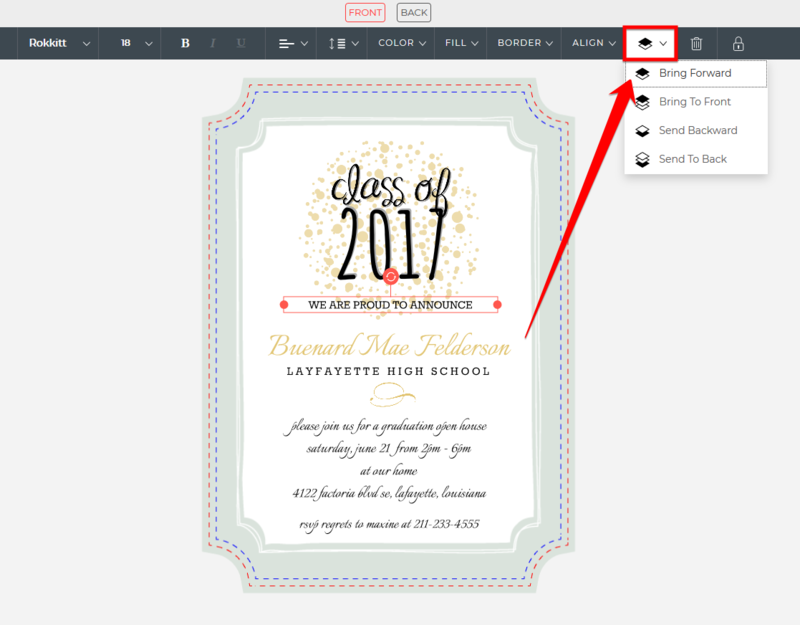 To do this, select the text and click on the Layers icon in the horizontal editing toolbar at the top of the page and select “Bring forward”(see photo below). This should bring your text in front of any other embellishments that are on top of it. How do I rotate embellishments? How do I center an embellishment on the card? How do I find embellishments? Can I change an embellishment’s opacity? Help! I am unable to move something on my design. Why? Can I change the color of embellishments? Contact Us – We are here to help! Call us at 425-484-1054 or 888-604-6089 between 8 AM (PST) and 4 PM (PST) on weekdays. If we are busy with other customers, just leave us a voicemail and we will get back to you asap. Alternatively, consider sending us an email at support@purpletrail.com or chat live with us. Click here to chat live with us. What are my options for planner add on pages? How does the Quick RSVP Service work? What does an orange alert sign mean? Can I personalize cards and invitations on my iPhone or iPad? How do I add text and photos using the PurpleTrail app?